BOSTON- August 9, 2017- Mayor Martin J. Walsh, the Commission on Affairs of the Elderly, and AARP yesterday hosted a panel discussion with age-friendly leaders from across Massachusetts.The forum highlighted the work happening in Boston and throughout the Commonwealth to make communities inclusive, welcoming, and safe for people as they age. As a member of AARP's Network of Age-Friendly Communities, Boston recently launched its Age-Friendly Action Plan, a comprehensive plan with 75 action items to create an environment where older adults continue to lead healthy and productive lives in Boston. 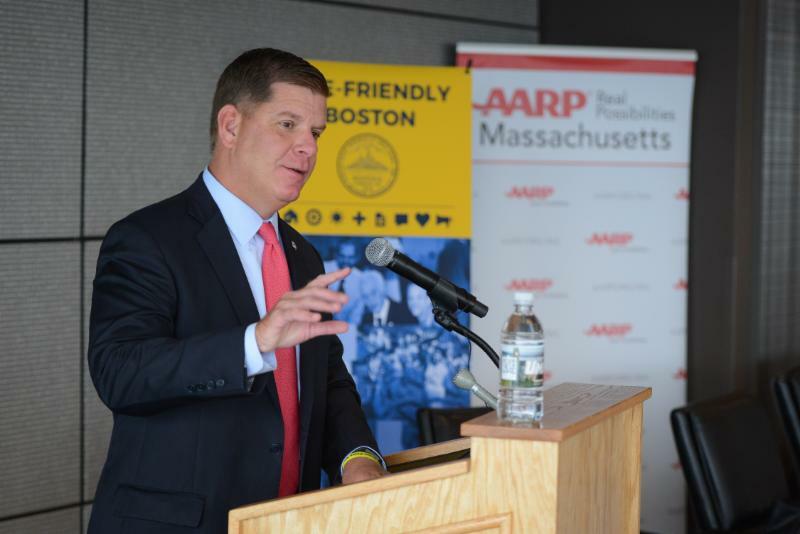 "Our Age-Friendly Boston Action Plan is our road map to make sure our City works for everyone, of all ages and abilities," said Mayor Martin J. Walsh. "It's a blueprint of specific, creative ideas generated from older adults in Boston, and we are proud to share that work and experience with other communities across the Commonwealth." Age-Friendly community leaders and experts gathered at the University of Massachusetts Club for a panel that brought together representatives from the Massachusetts Executive Office of Elder Affairs, the City of Boston's Elderly Affairs Commission, the City of Newton, the Town of Acton, and the Tufts Health Plan Foundation. The panel was moderated by Nancy LeaMond, AARP Executive Vice President and Chief Advocacy and Engagement Officer for AARP. "Mayor Walsh has been a leading voice fighting to protect healthcare and Federal programs that benefit older adults," said LeaMond. "Through plans like Vision Zero and GoBoston2030, Boston's transportation plan, Mayor Walsh has made it a major priority to make Boston even safer and the most walkable city." "There is a pressing need to create livable communities for people of all ages. In less than 15 years, one out of every five people in the country will be 65 or older, a demographic shift that will be felt in every community," said Mike Festa, AARP Massachusetts State Director. "In the city of Boston, we've seen Mayor Walsh' tremendous interest in and energy put toward tackling livability, with solutions that benefit not only older constituents but people of all ages." Carl Baty, longtime community advocate and a senior voice in Boston's Age-Friendly Action Plan, attended the event. Baty highlighted the amount of community engagement that led to the final plan and stressed the importance of continuing to have older adults involved in City planning. "If you've never been old, how do you know what older adults need?" said Baty. "It's good to get an invite and have a seat at the table." The Commission on Affairs of the Elderly facilitates full and equal participation in all aspects of life by older adults in Boston. The commission is dedicated to improving the lives of Boston's older adults by connecting them with resources and information, and it is focused on setting the City's direction for successful aging in Boston. Visitwww.boston.gov/elderly for more information.